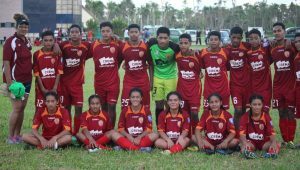 The Vahe Hahake Under 16 put in a strong showcase to completely dominate their third game to lead the table point after defeating Vahe Loto, 2 – 0. 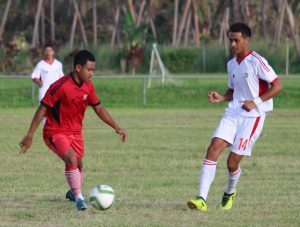 A small crowd had gathered at Loto-Tonga Soccer Center to cheer as Vahe Loto struggled to break down a well-organised Vahe Hahake defence. The best of these fell to Viliami Uasi of Vahe Hahake – in trying his luck from all corner of the field and in the last 10 minutes of the second half, he finally get his shot right to put up the opening goal of this match. 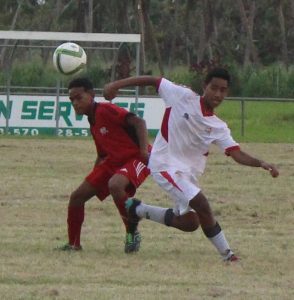 Not long, the best opportunity of the match arrived when a set play from the midfilders allowed chance for Viliami Uasi to put up his second and final goal for his team. The Vahe Hahake head coach, Losevati Muavesi was so pleased with the result. ‘’The performance of my team was really good and I saw them did everything to win this game,’’ Muavesi says. ‘’In the first half, both team were both frustrating but I kept on giving out coaching tips for my team,’’she added. ‘’We still have a lot to improve for the final like our attacking patterns, and I am glad, we will meet Vahe Loto in the final again this Saturday, ‘’she said. The Vahe Hahake will meet Vahe Hahake again in the final match of this tournament on Saturday 17th March at the Loto-Tonga Soccer Center.